The Technology Strategy Board GLEAMS project is currently investigating technology by which marine vessels will be able to surpass the very highest regulatory standards required for sulphur and nitrous oxide emissions, as well as slashing their carbon emissions and potentially reducing fuel costs. 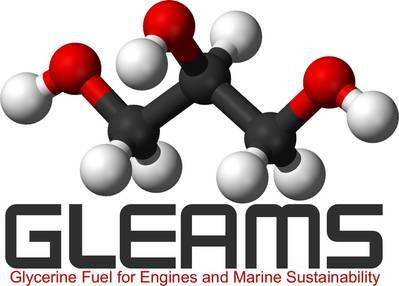 One solution may be the use of glycerol, (commonly glycerine), as a fuel for marine diesel engines. There is a global oversupply of glycerol, a by-product of the expanding biofuel industry. The characteristics of glycerol make it attractive for marine applications: burns with higher efficiency than diesel; very low NOx emissions; no sulphur emissions; virtually no particulate matter; nontoxic, water soluble and nearly impossible to ignite accidentally; requires modification only to the external engine aspiration system; readily retrofitted and engine technology proven through use in combined heat and power plant. Glycerol has a relatively low energy density compared to fossil fuels, however this is partially offset by increased efficiency. Although a greater volume of glycerol would have to be carried for a given range its low-hazard nature would allow additional storage in the hull space of many vessels. Although glycerol can be used in diesel engines of any size, until a comprehensive distribution network is established GLEAMS will concentrate upon markets where limited volumes of fuel are required and bunkering typically takes place at a single location. Potential early adopters could include offshore support craft, ferries, survey vessels, port/pilot boats, fishing vessels, dredgers, marine police and other small commercial and leisure marine craft. Pollution hazards associated with vessels operating in environmentally sensitive areas could be substantially reduced by the benign characteristics of glycerol. Potential end users and other interested parties can engage with the GLEAMS project by joining the GLEAMS Interest Group. Through an online forum members will be invited to discuss relevant topics and inform project outcomes. The project will explore collaborating with appropriate members in the future commercialization of this technology. During the project members will be invited to workshops, the first of which is scheduled for Thursday, February 27, 2014, hosted by Lloyd’s Register in London. More information will be sent to GLEAMS Interest Group members nearer the time. Membership of the GLEAMS Interest Group is free of charge and is available at groupspaces.com/GLEAMSInterestGroup/join.